GMTA (German Machine Tools of America) in Ann Arbor, Michigan represents the Profilator line of gear pointing, rounding, cutting, Scudding®, Hard Scudding ®, deburring and polygon machine tools for North America. The company provides full application engineering, machine building, installation, commissioning and all tooling from its operations in the U.S. and Mexico. These highly modular machines are use for polygon and slot facing, shifter stop machining, chamfering and deburring of highly complex automotive and other powertrain gears. The Scudding® and now the Hard Scudding® process sets the Profilator line in an unmatched position in the market for manufacturing efficiency. 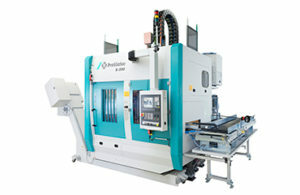 Hard Scudding® allows the machining of green and hardened gears on the same machine, using the same programs. The Profilator line of gear machines is found throughout the North American automotive OEM and major Tier vendors. German Machine Tools of America, founded in 1991 as the U.S. subsidiary of Profilator GmbH in Wuppertal, Germany and based in Ann Arbor, Michigan, today represents various lines of German machine tools and metal fabricating equipment, including gear cutting and honing, parts washing systems, special machine tools, tooling, laser welding, surface grinding and deburring machines, multi-spindle lathes, multi-station vertical turning machinery and more. With over 400 machines installed in North America, German Machine Tools of America (GMTA) is a market force in precision workpiece and specialty markets such as gear manufacturing, wherever accuracy is a must, regardless of the operation or end product produced. Engineering the right solution to meet the application is often just the beginning. Owing to the substantial capital investment made by their customers, GMTA remains constantly in tune with budget requirements and machine utilization, today and into the future.